Time to lighten things up a bit. As our dinner hosts this weekend would tell you, I could go on for hours about my dietary and life philosophy in general, but sometimes it’s nice to take a breather and keep things light. Enter this weeknight-worthy cabbage gratin from my new Christmas copy of Vegetarian Cooking for Everyone. It’s taken all my willpower not to purchase this book over the holiday season. I first learned of it from 101 Cookbooks, and holding it in my hands at Barnes & Noble I was immediately enamored with the huge variety of unique vegetarian combinations in dishes from soups and salads to beautiful pastas and casseroles. The cabbage gratin demonstrates this perfectly, using a watery vegetable you may not traditionally think to bake with milk and cheese, and countering any potential for blandness with an unexpected pop of concentrated tomato flavor. 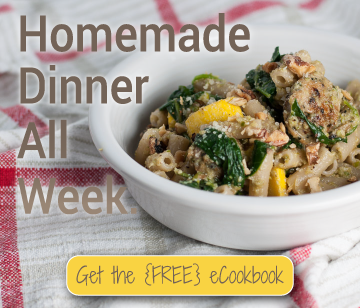 Full of pantry ingredients and one very inexpensive fresh vegetable, it’s perfect to make ahead for the week to come or throw together during the week. I’m putting my “What’s for Dinner?” posts on hold (if you haven’t noticed). Meal planning is still my jam, but in light of all the blog food I’m producing and Steve’s travel schedule, it’s way less wasteful to only plan a night or two of dinners each week, then just eat leftovers to fill the voids. I don’t want to totally drop cooking for pleasure, though, and I have a stack of new cookbooks I’m itching to use. Flipping through the gratins in Vegetarian Cooking for Everyone, trying to figure out what dish of cheesy creamy goodness to make for Steve upon his arrival home from a recent work trip, I came up with a solution to address the aforementioned concerns. I’ll cook my way through every gratin in the book, in order when seasonality permits. No excuses or flinching at the ingredient list: if it’s next and I can reasonably access the ingredients, that’s the next gratin. Deborah Madison’s recipes are a breath of fresh air in today’s universe of hand-holding instructions, with some ambiguity and, from the optimistic perspective, room to play. There are also zero photos in the book, so I’ll share mine and the exact ingredients and quantities I ended up using or would advise. Such as making sure to add lots of salt when using a watery veg like green cabbage. Aside from that tweak, though, this easy, one-dish bake (no bechamel required) is quite tasty and filling. And it’s just the beginning. Update 1/27/15 – What to do with the rest of the cabbage. Shred, thinly slice, or chop it, mix it with about half as much cooked barley (or any other grain or rice you have around) and a handful of thinly sliced red onion. For a dressing, whisk 3 parts olive oil, 1 part red wine vinegar, a bit of grain or dijon mustard, and a hefty amount of pepper. Toss to coat. Eat what you can. Refresh the rest with a little more vinegar the next day. I’m eating it as I type this, and it’s simple and delicious for lunch or a dinner side. Idea from How to Cook Everything Vegetarian iPhone app (Mark Bittman). Packed with pantry staples, one hearty, inexpensive veggie, and in need only of a side salad, cabbage gratin is ideal to make any weeknight or busy weekend special. Heat a large pot of water over high heat, adding a teaspoon or two of kosher salt just after it comes to a boil. Add cut cabbage and cook 5 minutes (it won't come back to a boil immediately). Drain and rinse under cold water. Lay cabbage on a paper towel laid over a dish towel, and press it with another layer of paper towel on top to get it as dry as possible. Whisk flour, milk, cream, tomato paste, eggs, ⅓ of the cheese, parsley, and seasonings until well blended. Add pressed cabbage and stir to coat every piece of cabbage in the milk and flour mixture. Grease a 9" glass pie plate (or similar sized, shallow baking dish) with the butter, add the parmesan, and tilt to coat the bottom and sides with the cheese, as if you were flouring a cake pan. Pour cabbage mixture into prepared dish, stopping to spread it evenly if needed. Top with remaining cheese. Bake on a rimmed cookie sheet (for easier handling and drips) on the middle oven rack about 50 minutes. If cheese browns before gratin is bubbly and heated through, cover loosely with foil. Cool 5 minutes or keep warm in a 200 degree oven, then slice with a sharp serrated knife and serve. I haven't yet experimented with gluten-free flours in this recipe, but I feel that it might work, given that you're not using the flour to make a roux. Arrowroot and potato starch are general good, finely textured flours to try, although it may not be a 1 to 1 exchange. I generally create my own GF flour blends, but this may be a good candidate to use a cup-for-cup store-bought blend. With great results, I'm on the third day of reheating this as leftovers. The microwave is just fine--the oven would be even better. Bring to room temperature for 30 to 60 minutes before reheating, if you think of it. 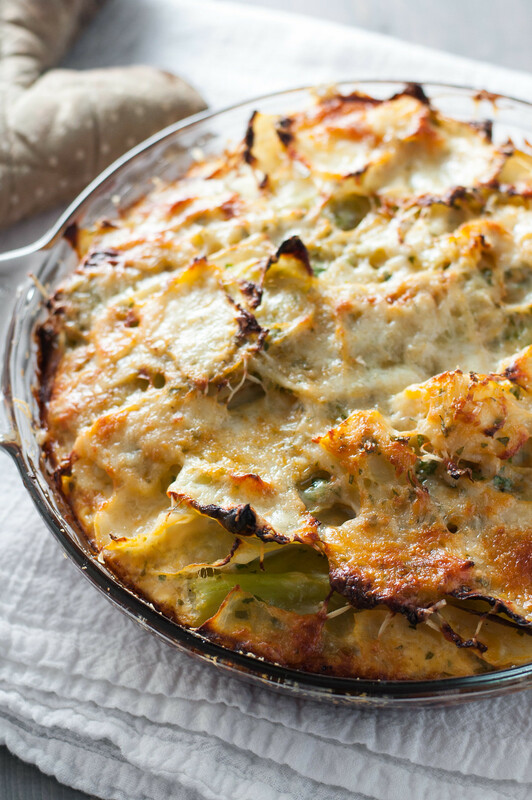 I love potato gratin, but this is a great lower-carb alternative, and it might be just the way to get my kids to eat cabbage!! I’d agree! It’s definitely very cabbage-y, so you could even throw in a little more cheese than I’ve used to make it extra kid friendly. this makes me want to make cabbage asap. 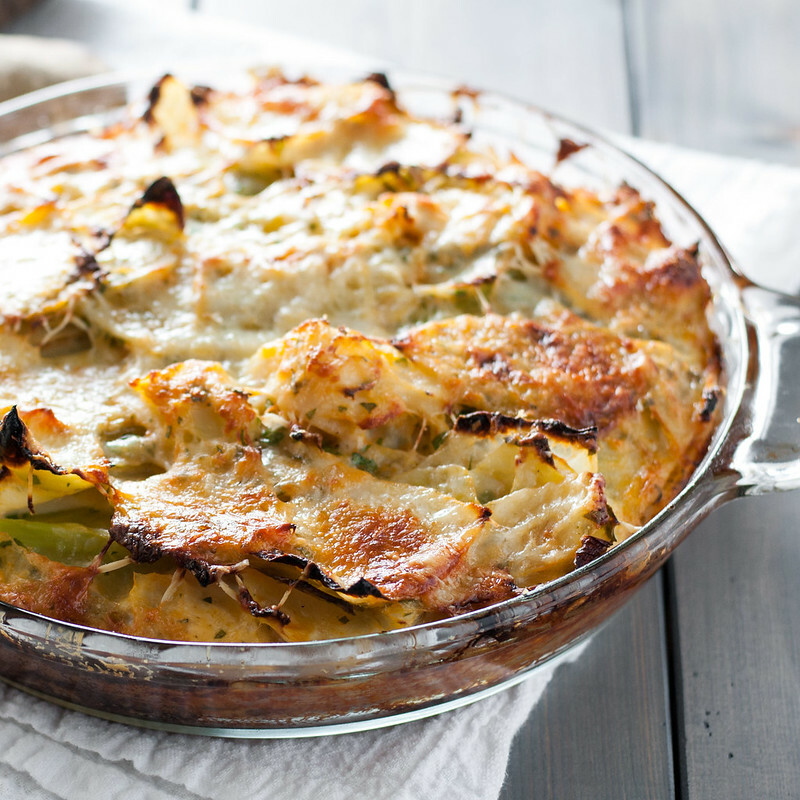 I love gratins but never have made a cabbage before.. so this is a must try recipe for me. It looks so comforting and indulgent. It is! Considering I can’t warm up even in our mild winter weather, it was the perfect semi-healthy comfort dish. This looks and sounds so good. I make creamed cabbage and love that so this is right up my alley! Made this recipe last night. It was delicious! It was almost to pretty to cut in to. I loved it! Awesome! This was the first gratin in my “series”, but it’s still one of mine and my fiancé’s favorites. This is going to taste good. I am sure my husband will love this one, last time he didn’t like this chicken and rice casserole. I tried it 4,5 times continuously to perfect it. The next on my menu tonight will be your recipe. I am going to adjust it by adding few of my own ingredients in it. I am amazed how you website guys make recipes and foods tips. I am a IT related women, I always praise work that you guys do so i make sure to give credit. 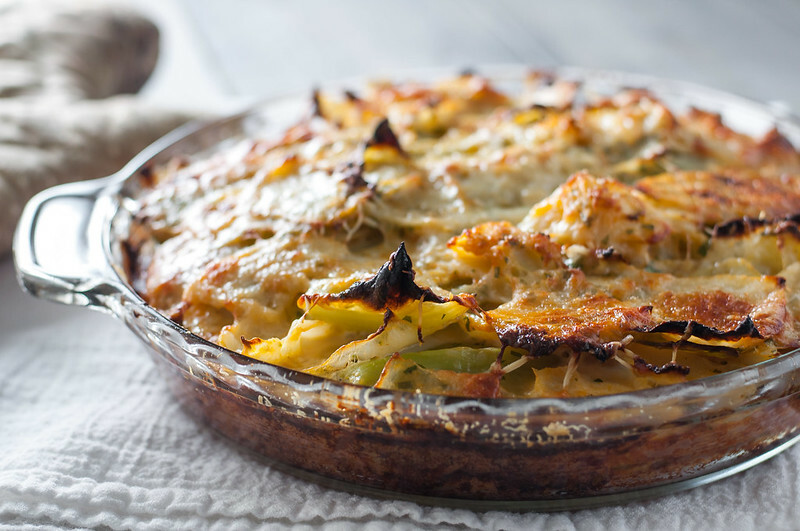 The Easy Cabbage Gratin looks great, but I am confused on the cabbage prep. are you coating every leaf of the cut cabbage because I assume it will fall apart from the 2 inch sqrs? Tom, exactly. When you stir the cabbage into the cream/egg mixture, it all gets coated and the pie holds together quite well in the end. Thanks Tessa ! I was reading your spaghetti squash gratin recipe and if I may I would like to share what I think is a better way to cook spaghetti squash. You just cut it in 1in circles and the seeds come out easier , then roast in the oven, it takes a lot of the moisture out and the strands are more like spaghetti.